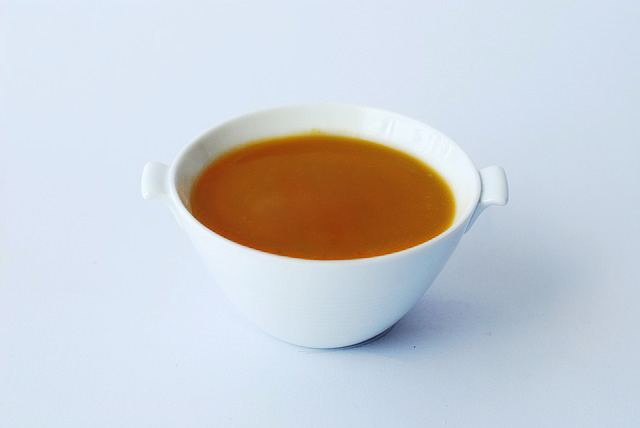 Bone Broth: Go for the Gold! Do you want to go for the gold? Do you want to feel fantastic and give your body what it really needs? Then try indulging in a warm cup of bone broth. It’s liquid gold. Bone broth is rich in protein, minerals, collagen, and other vital nutrients. The protein in bone broth is highly absorbable, meaning even if digestion isn’t optimal, the body is still able to absorb the protein. Even though we can get protein from eating quality chicken, turkey, beef, and eggs, the protein-filled gelatin in meat broth attracts liquids that encourage digestive juices for rapid and effective digestion. Foods that are hydrophilic, like bone broth, attract liquids during the digestive process, encouraging more efficient digestion. A good quality, homemade bone broth will have a gelatinous consistency. This process involves using a whole chicken with bones and the skin; it also uses any parts that come with it! The gelatin also contains collagen, which supports healthy skin, nails, hair, and joints. Bone broth is super rich in minerals. Minerals are extracted from the bones, cartilage and marrow of the meat during the cooking process. These minerals provide electrolytes in a form that is easy for the body to absorb. Apple cider vinegar needs to be added to the broth in order to acidify the water, which will pull the minerals from the bone, specifically calcium, magnesium, and potassium. Minerals are absolutely essential to nourish the endocrine organs, which regulate hormones. Every endocrine organ in your body is dependent on a specific mineral. For example, the thyroid needs iodine and the pituitary gland needs manganese. The minerals in bone broth will mineralize bones and teeth. Bone broth contains many amino acids from protein, like glycine. Glycine is necessary for cellular function, blood sugar regulation, and digestion; it also enhances muscle repair and growth. These benefits are ideal for everyone, but especially people with muscle and joint injuries, recent surgeries, or people that workout often. Glycine repairs muscles, tissues, ligaments, and joints. Glutamine is a hydrophilic amino acid that is present in most proteins, including bone broth. People commonly associate glutamine as an amino acid that body builders take to build muscle. However, it also supports the immune system, aids the liver in detoxification, heals the lining of the gut, and helps the villi of the small intestines to heal and grow. Glutamine is essential for clients that have any type of digestive distress, especially people that have diagnoses like irritable bowel syndrome, ulcerative colitis, and Crohn’s disease. Bone broth is also rich in the amino acid arginine. Your body needs arginine in order to have optimal kidney function. The kidneys are one of the most important organs in the body because they filter your blood 50 times per day! The kidneys filter not only pathogens like bacteria and viruses, but also toxins like chemicals or metals. The amino acid arginine supports heart function, lowers blood pressure, and is foundational for wound and gut healing. Recently, I got a pretty nasty burn from the toaster oven. I noticed that the burn healed super-fast. I could significantly see the healing from day to day. I have no doubt in my mind that it was the bone broth that I have been drinking daily for the last few months. My family was so tired of hearing me say how fast my burn was healing. I was telling them if anyone has any doubts about the benefits of good nutrition, whether it be supplements or quality foods, like bone broth, here is the proof! Not only does bone broth help to heal wounds on the skin, but it also improves skin elasticity and smoothness. Oftentimes, female clients will ask me what they can do about the appearance of their skin as they get older. Bone broth! The collagen and fat in the bone broth improve the integrity of the skin by plumping it up. The minerals found in bone broth hydrate the cells, preventing dehydration. Remember the dehydration test! Pinch the skin on the back of your hand: if it stays pinched for a few seconds you are dehydrated, if it bounces right back, you are not dehydrated. Lastly, bone broth contains good quality fats that your body needs for optimal gallbladder function, brain health, and hormone function. A good quality, homemade bone broth is beneficial for everyone. The only exception would be for someone who really cannot digest fats. In that case, you can always take the fat off the top of the broth when it becomes solid in the refrigerator. Another option would be to come to the Well of Life Center so that we can help you digest fats. You need them! We have a recipe and instructions that we can offer you here at the Well. If you are a client, please ask your clinician about it the next time you are in for an appointment! If you are not a client at the Well, there are many great recipes on the internet that you can try. Just search for “Bone Broth Recipe,” and there will be lots of options. We highly recommend our particular recipe because it contains all the components necessary to be as beneficial as possible for your body; however, we do reserve our company’s recipes and instructions for our clients. If you live in the area, please come in for a visit; we can help you get to the root of the symptoms you may be experiencing right now, and offer you guidance to truly healing! Thanks! We do have a recipe that we use at the Well. If you are a client, please ask your clinician about it the next time you are in for an appointment! If you are not a client at the Well, there are many great recipes on the internet that you can try. Just search for “Bone Broth Recipe,” and there will be lots of options. We highly recommend our particular recipe because it contains all the components necessary to be as beneficial as possible for your body; however, we do reserve our company’s recipes and instructions for our clients. Thanks!